Jeff Coutelou produces a large range of different wines, or cuvées, every year. There are a number which are made every year, les incontournables. These are the biggest production wines, the breadwinners and, probably, his best known cuvées, Classe and Vin Des Amis. Depending upon the vintage Jeff will then decide what to do with the grapes he has left and which cuvées to produce. Some of these extra cuvées reappear regularly, others very occasionally and some will be new. So, let’s start with the more celebrated wines. For the natural wine-sceptic, it’s hard to think of a better place to start than the wines of Jeff Coutelou: full of vivid, finger-staining blackberry fruit, this carignan is explosively juicy and succulent: pure pleasure. Usually a blend of 40% Grenache, 40% Syrah from Segrairals and Sainte Suzanne vineyards. In older years the remainder was Carignan, more recently Cinsault and a little Mourvèdre. Around 13,000 bottles of Classe are made with their distinctive pink labels showing a diamond. I always think of Classe as having a slightly darker fruit profile than Vin Des Amis whilst retaining its charm and drinkability. Whenever I share Vin Des Amis with people they always sing its praises and ask for it next time, it is well named. Another striking and unusual label gets it noticed but the fruity freshness are what makes people love it. More Syrah from Segrairals with just a little Grenache from the same vineyard blended in. The different cuvées are based around different vinification methods as well as different parcels. The 2010 of Rue De La Pompe was a wine of the week for Jancis Robinson who also considered the 2012 as being like a northern Rhone wine with a bone dry profile. There are raspberry and pepper notes and the trademark freshness and vivacity. Another large production in most years, around 10,000 bottles or so, it didn’t appear in 2014 because the Syrah was very low yielding that year and was used for the two big cuvées. The wine is called after Jeff’s address incidentally. Citerne was another well known cuvée which did not appear in 2014. Largely Mourvèdre with some Grenache, again from Segrairals, this is wine which was originally made from grapes which Jeff didn’t use elsewhere, hence the name of the cuvée meaning saved from the tank. This was always one of my favourites with blackberry and blackcurrant flavours and an earthiness from the Mourvèdre. That cépage has done very well recently and was bottled as a single variety wine in 2014. Jeff has other plans for the Mourvèdre of 2015 with another cuvée planned mixed with Syrah and Cinsault, I have tasted it and it is lovely, very elegant and precise. Sauvé De La Citerne will reappear with a 2015 however. It fits with the idea of making the cuvée from otherwise unused grapes that this year will see a blend of Grenache with a little Syrah. It will therefore be different but again my early tasting of it suggests a very attractive wine. This is probably my favourite cuvée of all and sadly it hasn’t appeared since 2013 and nor will it this year. Made purely from Syrah from the La Garrigue vineyard where the vines face northwards, this might explain the fresh acidity and vitality of La Vigne Haute. That acidity means that Vigne Haute ages extremely well and gains even more complexity. It is classic Syrah, red fruits and spice with great length and balance and beautiful aromas. It would be my desert island wine. There was a pure Syrah in 2014 and another is planned for 2015 but under a different name, it is lovely but I do miss Vigne Haute, fortunately I have quite a few bottles tucked away until it reappears (please). 5SO has quickly become established as a Coutelou favourite, around 7,000 bottles are made. Its name is a play on Cinsault and the wine is indeed pure Cinsault from the Segrairals vineyard. Designed as a light red, easy to drink it is delicious in summer slightly chilled and a great wine for drinking without food. Fresh cherry and raspberry flavours and a light structure make for a lovely wine. Named after a barbecue tool Flambadou is pure Carignan from the vineyard Rec D’Oulette. It reappeared in 2013 and was also made in 2014 and 2015, made in smallish quantities as this is a small, low yielding vineyard. Jeff considered the 2013 as the star wine of that vintage and the 2014 is also amongst the best. More full bodied than some of the other wines the Carignan brings dark fruit flavours and aromas. There is a brooding undertone of spice and plenty of red fruit freshness on the finish. Another wine which ages well. The vines are on an open parcel of ground so well exposed to the sun, the freshness a reflection of the healthy soils and skilled winemaking. Carignan is making a comeback in the Languedoc Roussillon and this is one of the best examples of why. Carignan enthusiast Michel Smith in his series on Carignan bottles praised Flambadou as follows, ” La bouteille a été vite vidée, ce qui est un bon signe”. A relatively new addition to the Coutelou cannon. Flower Power is a true expression of terroir as this is a wine made from a variety of grapes from one parcel, Font D’Oulette (as the name suggests not far from where Flambadou originates). Jeff has begun to complant grape varieties more and more and to produce wine made from that mix of grapes. This is the first wine to show the results and it is a winner. 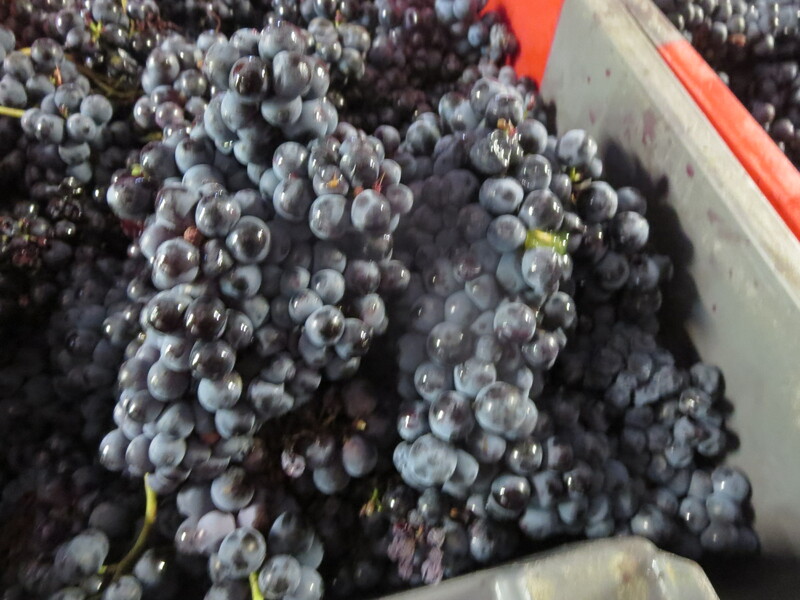 Aramon and Oeillade Noir are just some of the grapes in the mix of Flower Power. Aramon was once one of the most planted of all grapes in the Languedoc but went out of fashion as it was often overcropped and dilute. 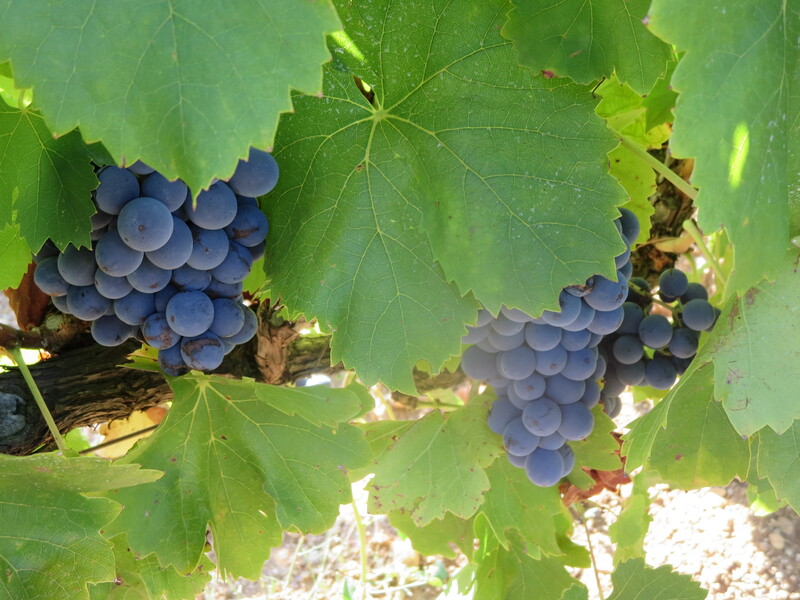 Now vignerons are realising that when it is grown with lower yields Aramon produces flavoursome wine. Oeillade is also interesting, a grape related to Cinsault, another old Languedoc variety which Jeff wants to bring back. 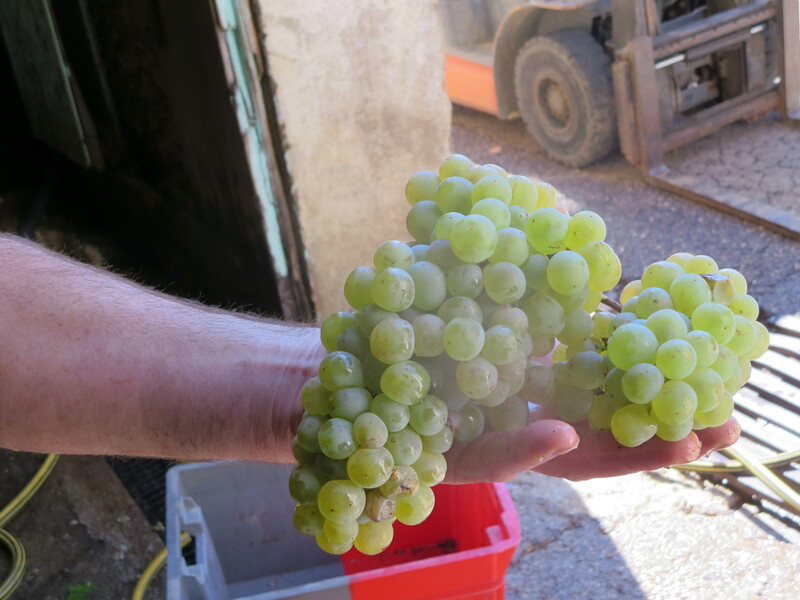 Just to add some mystery there are some Clairette Musquée grapes in here, a white grape. Flower Power is lightly structured but packs a punch with flavours of black cherries and red fruits, and, appropriately, it is very aromatic, perhaps from the influence of the Clairette. As the vines age this will become more structured I would imagine but it is already a favourite. In the last week La Revue Du Vin De France selected Flower Power as one of their top 50 Languedoc wines, an accolade from a source which does not usually favour natural wines. Now here is a fascinating wine. L’Oublié is a blend of cépages AND vintages. The wines are aged in old barrels, not the usual practice of the domaine. Carignan was the forerunner with some 2001 and then more Carignan 2007 and 2010 were added. 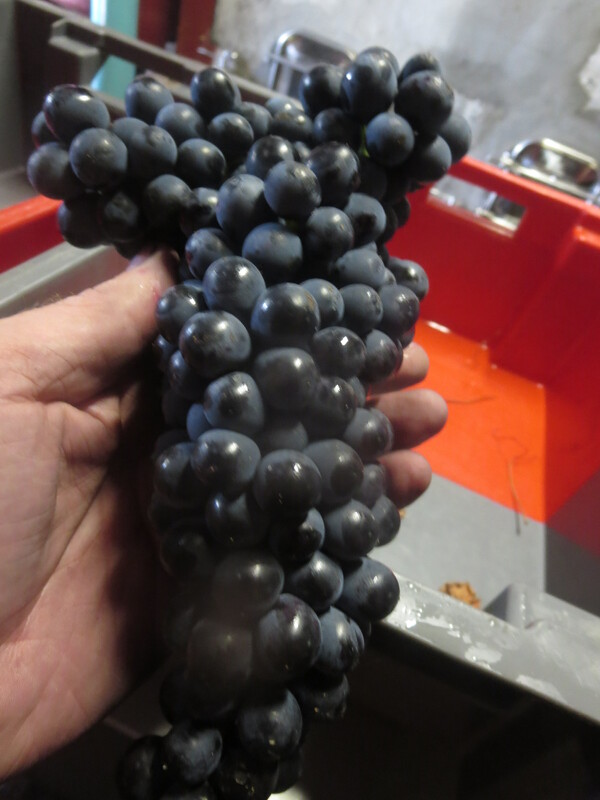 Then Syrah joins the assemblage, grapes from 09, 10, 12 and 13. This blend forms L’Oublié, the forgotten one. I imagine this refers to the original 2001 Carignan barrel. It has aromas of dark fruits and leathery, spicy notes too. It is dark flavoured too, blackberries, liquorice and even coffee are just some of the many complex flavours. It benefits from decanting to allow that complexity to resolve itself a little, and it will stay fresh for days after opening. There are not many wines like this around and I honestly don’t know why. It is unusual and one of my favourite wines because of its complexity, its balance of older and more youthful flavours. Terrific. This was a wine which used to be a regular but disappeared after the 2003 vintage. It reappeared in 2013 and became my favourite wine (or have I already chosen another?!). Cinsault is the grape but it is a more complex wine than 5SO Simple, richer, darker and more structured. The grapes come from the beautiful Rome vineyard and are from 40 – 50 year old gobelet vines which bring low yielding fruit, rich and elegant. The wine is recognisably Cinsault with cherry notes but it has attractive depth and power, very long flavours of red fruit and peppery / spicy too. Sadly 2015 did not bring enough fruit to make Copains so enjoy what is available, it is worth ageing a couple of years but difficult to resist now. Other red cuvées are made for restaurants and and as one offs. A lovely pure Grenache was made in 2014 for example whilst Tete A Claques and Buvette A Paulette are others which appear from time to time. It is fair to say that Mas Coutelou is best known for its red wines but there are some very good white wines too. They make up around 15% of the vineyards made up of a multitude of white grape varieties. The most regular of the white bottles though Jeff has started to experiment with various other blends and single variety wines. Most of the white grapes are grown in La Garrigue and Peilhan vineyards. PM usually contains Sauvignon Blanc from La Garrigue but assembled with other white grapes which are available such as Grenache Blanc, Macabeu, Muscat and Carignan Blanc. Dry, clean and full of flavour PM has texture and white fruits galore. Single variety white wines in recent years have included, for example, Carignan Blanc from Peilhan. If Jeff feels that the grapes are of particularly high quality he will make a single variety wine. They always wear the mark of fresh acidity and the grape brings different fruit profiles, the Macabeu with aromatic yellow fruit for example. 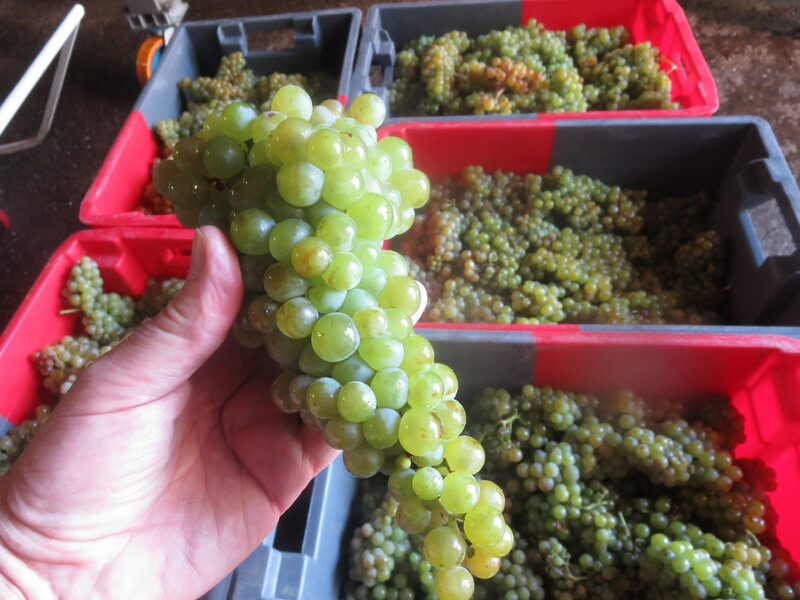 The Macabeu will appear from the 2015 vintage. I am a particular fan of Carignan Blanc and Jeff’s version was very clean, mineral and long lasting in flavour. This year he is combining it with Grenache Gris which did well in 2015 in Peilhan. Most of these white wines come in small quantities. Muscat grapes grow in Peilhan and Rome and appear in some white blends as well as PM Rosé. The rosé is very aromatic and a dry wine, good with food and also on those hot, Languedoc summer days. 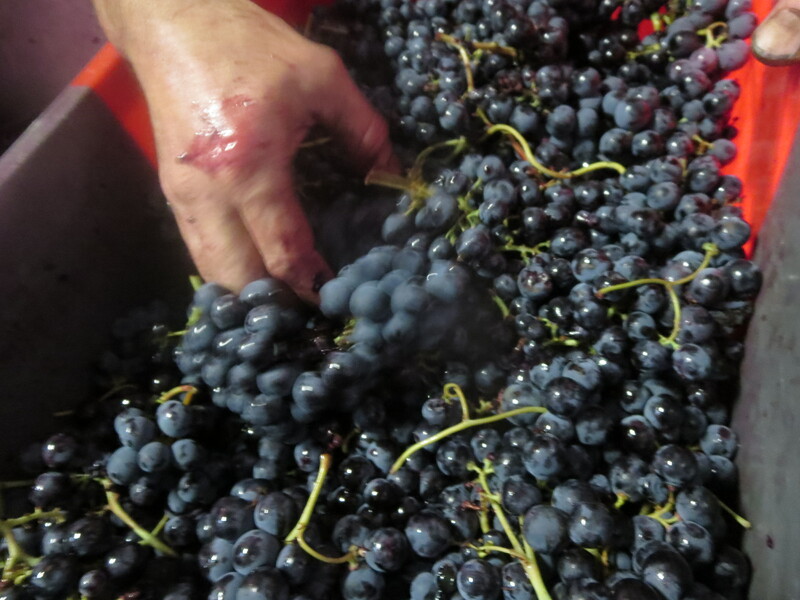 It usually has juice from Syrah and Cinsault, pressed after a short time on skins. Sparkling wines are also made at Mas Coutelou. Bibonade (think lemonade) has appeared in various forms, white and rosé and sometimes sweet! The dry version is fresh, clean and appley, a perfect quaffing wine and disappears very quickly after opening. There is usually Sauvignon Blanc, Muscat and some Grenache Blanc in there but again Jeff will play around with what he has available. This is my wife’s favourite wine! Another sparkling wine which was popular in the 2013 vintage was Blanc Frisant. 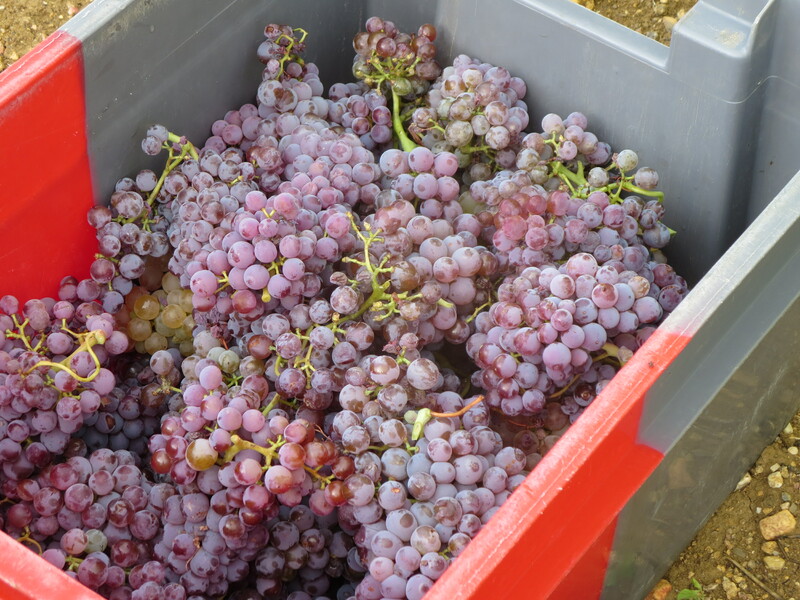 Macabeu and Grenache Gris grapes were bottled with a small quantity (8g) of sugar to encourage a second fermentation in the bottle. This produces a small quantity of CO2 bringing a light fizz when the bottle is opened. It was wonderfully refreshing with citrus and spice flavours. It is another example of Jeff’s inventiveness and experimental nature. Sweet wines are made too, have a look at my article on the solera system. So there we are, a huge array of different bottles, something for everyone. Fruit, freshness and drinkability are the hallmarks of Coutelou cuvées, they all contain those three qualities and many more. Jeff’s restless search for better wines means that the cuvées change every year (with two main exceptions). As he develops the cellar with more cuves available he will no doubt continue to produce new wines. As new plantations of grapes such as Riveyrenc, Terret, Morastel and Piquepoul Noir mature there will be even more variety. However, buy with confidence whatever is available is very good. Categories: Wines | Tags: 5SO Simple, 7 Rue De La Pompe, Bibonade, Classe, Coutelou cuvées, Flambadou, Flower Power, L'Oublié, La Vigne Haute, Les Copains, Mas Coutelou, PM Blanc, PM Rosé, Sauvé De La Citerne, Vin Des Amis | Permalink. It’s been a few weeks since I updated about events at Mas Coutelou, partly due to Millésime Bio and, partly, because it’s a relatively quiet time. That is not to say nothing has been happening, far from it. Millésime Bio and Le Salon des Vins De Loire are two huge events in France attracting many thousands of trade visitors. As you have seen with Millésime Bio these salons also attract satellite events and Jeff takes part in those. Les Affranchis in Montpellier and La Dive Bouteille in Saumur last two days each and so adequate samples of the wines need to be prepared, transported and poured for guests to taste. Those events alone take about 7 days of the last month. I know from feedback from various people who sampled Mas Coutelou wines at both events that they enjoyed the wines which were samples from cuve (tank) of the 2015 cuvées such as Vin Des Amis, Classe, Syrah, PM Blanc and Flower Power. Hopefully the salons will spread the word about how good they are, the elegance and finesse of the vintage is obvious as you taste it. Those visitors were also presented with Jeff’s annual Carte Des Voeux, his new year greetings card, together with his summary of the last year’s events, weather, vintage and cuvées. The Carte’s original is printed by hand and this year’s was especially complicated to print because of the different colours used. The message is worth the hard work. For the last several weeks pruning (taille) has continued. Julien is leading the work this year and his back must be getting sore by now. It is hard work! The importance of good pruning should not be underestimated. It maintains the health of the vines, removing damaged or sick wood. It reduces the number of canes which will grow grapes so that the vine’s energy will produce quality rather than quantity, probably reducing potential yields by half. It also shapes the vine so that future work such as ploughing and harvesting will be more straightforward. I wrote about pruning last year describing the different methods. I visited Julien in Peilhan vineyard on Monday, the same day as I saw a pruning machine at work in a nearby vineyard. It certainly does the job quickly and more cheaply but looking at the vines afterwards it was hard not to think that the machine did not reduce the number of canes to limit yields and, of course, cannot check the health of the vines. Julien and his fellow tailleurs are more costly but, to my mind, essential for good vineyard management and, ultimately, good wines. Michel was also in Peilhan, making sure that the pruned vines were tied to their trellis. If the vine is not straight he might stake itfor support and then tie the vine to the stake using a fastener called a ‘queue de cochon’ as it resembles a pig’s curly tail. This will help to avoid the vine being knocked during ploughing or other work. Meanwhile, in the cellar it has been a hive of activity. One of the features of the cellar has been a large basket press which has been used by the Coutelou family for generations. Sadly, it has been out of use for many years and became something of an obstacle as work was done, especially during the vendanges. Jeff reluctantly decided to remove it, I know this was a difficult choice for him. It proved to be a much more difficult task than anticipated as the press screw went deep into the ground and a massive hole still didn’t get to the bottom of it so, eventually, it was sawn through to enable the whole press to be moved. The story does have a happy ending though as the press is on its way to Jeff’s friend Didier Barral where it will be put to good use. The result is certainly more space in the cellar, even if a part of the domaine’s history has disappeared. Another big tank (cuve) has also been split into two. 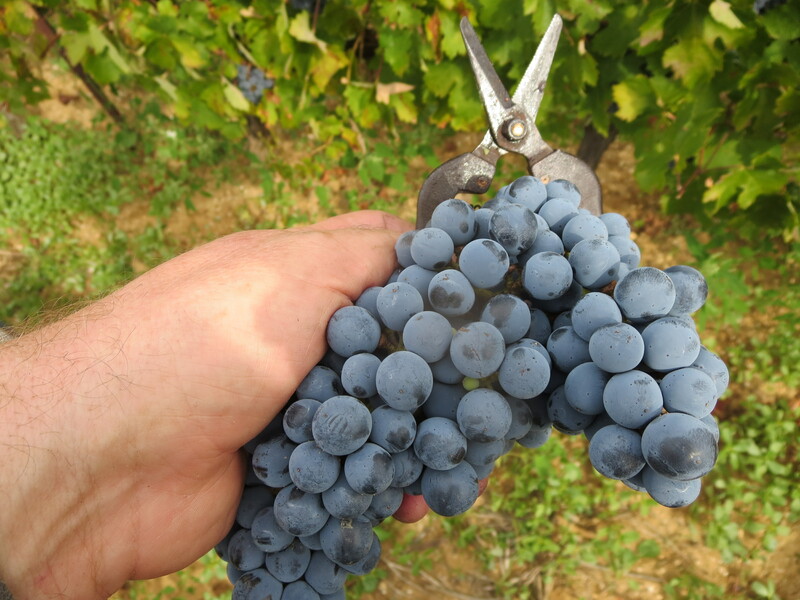 Jeff will be able to vinify smaller quantities of wine and have more choices about the most suitable cuve for grapes as they come in at harvest time. Finally, for those of you who want to find out more about Mas Coutelou a new website is available. I have included a link at the top of my page and invite you to have a look at the site. Jeff wrote the text for it (I did the English translation) and it will inform you about the philosophy, methods and wines of the domaine. And it is those wines, the different cuvées, that I shall be writing about next time. Pour les lecteurs français je m’excuse, j’ai des grandes difficultés de mettre à jour la page en français. J’ai demandé à WordPress pour résoudre le problème. Categories: Vignerons, Vines, Wines | Tags: Carte Des Voeux, Classe, coutelou.fr, Flower Power, Mas Coutelou, Peilhan, PM, pruning, taille, Vin Des Amis | Permalink.